The bird that wants to be a caterpillar… until it grows up « Nothing in Biology Makes Sense! There is a long history of organisms evolving to look similar to toxic/poisonous organisms. 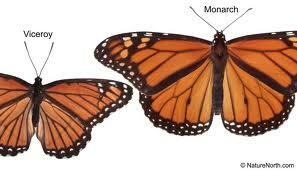 For example, there are a plentiful number of butterflies that resemble the very toxic monarch butterfly. But this is a new one for me: Chicks of the cinereous mourner has plumage that looks exactly like the caterpillar. It even moves the way the caterpillar moves! Check out this article over at National Geographic.